Note: A couple of years ago I wrote a detailed post about how I cook Kosher for Passover, or K for P as I call it. Click here if you care about such things. Call this one an interesting failure. 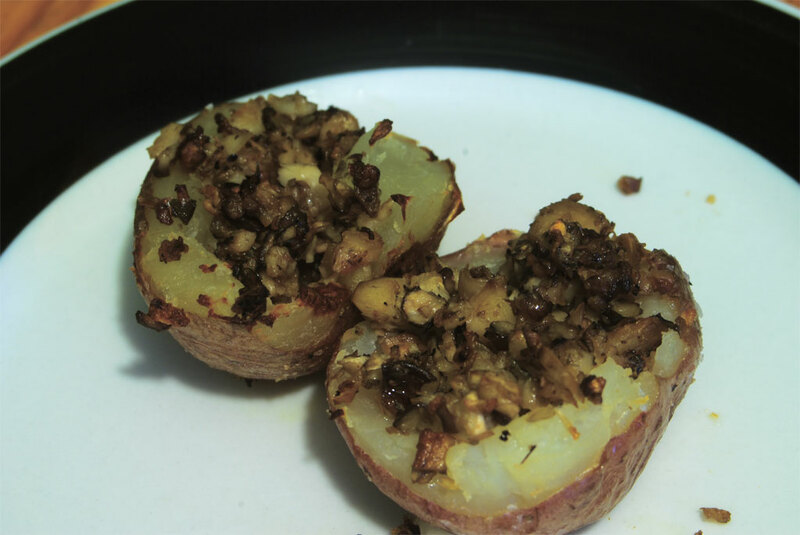 The idea was to get the crispy jacket of the potato to act as a cup for the smooth duxelle. It ended up being the other way around. Perhaps I shouldn’t have used those soft red potatoes, but I coated them with oil, salt, and pepper, then baked them in a 400 degree oven for about half an hour. While they cooked I made the mushroom duxelle — I used shitakes and oyster mushrooms because that’s what I had, but I’m sure anything would be fine. In order to get the mushrooms into tiny pieces you need either a lot of patience or a food processor. I used a food processor. Then the mushroom bits were cooked in olive oil and butter until the moisture was almost all cooked out, then seasoned. Then I added a splash of wine leftover from the Seder. When it cooked down I let it cool for a few minutes. When I pulled the potatoes out of the oven they were cooked through but they almost liquefied when I cut them in half. I tried scooping out the interior, but they were way too soft to do it well. Undeterred, I filled the best looking ones with the duxelle, which tasted good but was a little crunchy. I baked them again for about ten minutes. This didn’t do much to crisp up the potato skins, but it did dry out the mushrooms even more. I ended up mixing the rest of the potatoes directly into the remaining duxelle; everything tasted good, it just wasn’t what I had intended to make.